Hi everyone! I kinda fell off the blog wagon for a week because I've been busy that and I couldn't find my camera until tonight. lol My husband hates how I can never remember where I put things. My youngest sister Angelica (Geli) got married and I wasn't there but I did put together a card to go with her gift. I can't believe I missed her wedding but those are the kinds of things we have to sacrifice with being overseas. I used Jen Del Muro's sketch for this week which was really fun and one I'll turn to often I'm sure. The card base is Rose Red with Regal Rose layered on top. I used Stampin' Up! Raspberry Tart dp paper which I LOVE! It was my first time ordering this paper and will order some more soon. I used the stamp set Botanical Blooms by Stampin' Up! which is one of their Sell-A-Bration's sets. Very pretty and delicate set that it is. 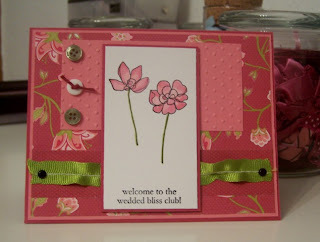 I used my Swiss Dots cuttlebug embossing folder and finished the card off with 3 buttons. Now I just need to go out and find her wedding gift here in Germany and mail it off. wow this is fantasatic! sorry you missed her wedding but she will LOVE this! This is gorgeous! She will love it! What a pretty card. I am sure she will love it! Isn't that paper fab, haven't really looked at that SAB set too much, might have to now. What a beautiful card. Such a shame you missed her wedding, but I'm sure she'll love this card. Felicia - this is beautiful. I just love the sentiment and the ribbon. I am sorry you missed her wedding, but I'm sure she loved this. Beautiful colors. How pretty! so cheerful and feminine. TFS!